The main airport is Barcelona – El Prat. Vueling is one of the most well-connected and affordable option that operate on this airport. The airport is well connected with the city by metro, train, bus, and taxi. Metro line L9S connects directly the airport and the conference (L9S – “Zona Universitària”) – More information in here. Barcelona is also well connected by train, and car. UPC Nord Campus hosts the conference (c/ Jordi Girona, 1-3, 08034 Barcelona). Nord Campus can be easily reached by Metro ( L3-“Palau Reial” / L9S – “Zona Universitària” ), by Tram (T1/T2/T3 – “Palau Reial”), or by Bus. The best way of transportation in Barcelona is the metro. The single ticket costs 2€. The ‘T10‘ is multi-personal and valid for 10 trips and its price is around 10€. The tickets can be bought inside the metro stations, in the automatic machines (english language and credit card accepted). 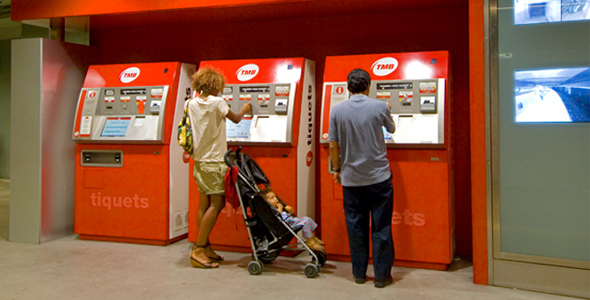 However the T10 ticket cannot be used for the metro stops Aeroport T1 and Aeroport T2. You would need to buy a special Airport metro ticket if you want to use the metro to get to and from Barcelona airport.